Whether it is a Roman helmet, Viking Helmet, Medieval Helmet or Science Fiction Helmet you want to make, paper mache (papier mache) is an excellent modelling material for armour. The main advantages of paper mache for armour is that the resulting helmet is easy to make using readily available materials, is safe for kids and costs practically nothing. 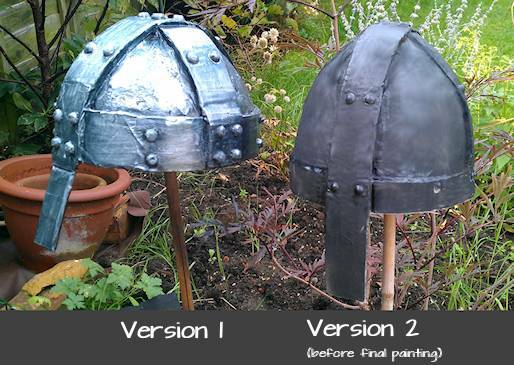 How to make a paper mache Norman helmet. The photo above is my Mark II European Medieval Spangenhelm. It is solidly built and looks good enough to fool the eye from about 4 feet away. Most helmets are fairly similar so the construction methods are pretty similar too, regardless whether you are making a Norman Spangenhelm like this or a full on Star Wars Stormtrooper’s helmet. However there are two main methods of helmet construction to be aware of. We will call them the ‘inner’ and ‘outer method. A bowl shape that is about the right size is needed. If you happen to have a perfectly sized ceramic bowl in the kitchen you are in luck, because this is needed for the inner method.. However most of us will make our bowl with cardboard and balloons (the outer method). The inner method is a little less effort, but the outer method produces helmets that are made to fit the individual head of the wearer. The above helmet was made using the inner method. First apply vaseline to the inside and lip of your bowl (vaseline stops the paper mache from sticking to the bowl). Now tear (dont cut) strips of newspaper about half an inch square and dip them in a bowl of water and wallpaper paste mixed to the consistency of a milkshake. Lay the strips in random directions, covering the bowl’s inside. Tearing the strips rather than cutting with scissors leaves a less noticeable edge which helps give you a smoother finish. Leave the first layer to dry completely and then apply a second layer (it helps to switch to a different paper (such as brown wrapping paper) so you can easily see where you need to add more paper to make your paper mache equally thick. Again leave to dry and then add a third layer, switching back to newsprint. Repeat this process till you have 6 layers built up. Once dry this can form the basis of most helmet types. First get some cardboard and cut long strips about 3/4 of an inch wide. These should be measured around the wearer’s head and taped together as in the following picture. This is now a stable platform upon which to layer paper mache. To make the shape rounded, inflate a baloon inside the cardboard cage and use this as an additonal mould. A good smooth finish is easily achieved using a gesso layer. Gesso is chalk powder, glue and water and it really does give you a porcelain like finish to your paper mache. Once you have painted on 2 coats of gesso (allowing it to dry between coats) You can sandpaper it to a perfect out layer, ready to be painted over the top for a surface that can look like plastic, metal, pottery, wood or stone. My recipe for gesso is 2 parts chalk dust (available from building supply stores) 2 parts PVA glue and 1 part water. Mix it all together to a consistency of thick paint and apply with a brush. 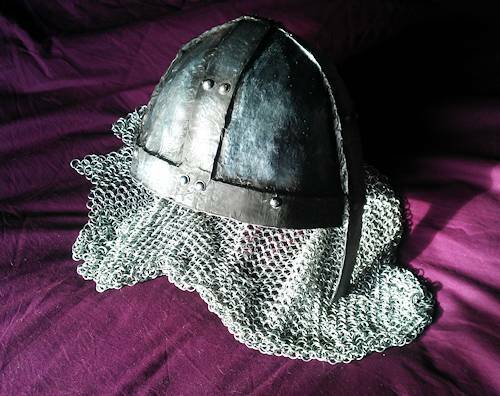 My first helmet (a medieval – Norman spangenhelm) was fun to make but the end result was pretty awful. The shape was wrong, the cardboard was still obviously cardboard and it all looked a bit pants. However I learned a lot and took the lessons with me when I made version 2. The key lessons I think are as follows. Firstly make sure you get the proportions correct. If it looks the right size, shape and colour, then people ignore the finer details to a great extent. With helmet 2 I bothered to measue things accurately from the outset. Secondly, if you are in a hurry, a cloth mache is excellent for speed. I had some really cheap open-weave cloth dustsheets which I used instead of paper. 3 layers of cloth mache seems to be as strong as 6 layers of paper. Take care with lines. On helmet 1 I didn’t bother to cut the carboard bands particularly straight so there was a lot of unevenness that was pretty obvious. The picture above shows version 2 after I sprayed on an undercote of black paint but before I added any metalic paint. In version 1 the finish used way too much silver and looks more like a christmas bauble than an ancient piece of armour. The rivets on version 1 were made from short lengths of dowel which I sanded to a dome shape and cut. This was a long boring job so on helmet two they are small furniture protection pads I saw going cheap in a diy store. The paint is acrylic. When adding the metalic coat over the black, use a very dry brush. Dab the paint onto the brush and then get rid of 99% of it on a paper towel before applying the brush to your helmet. You really should have to work hard to get the remaining paint off the brush and onto the helmet. Dry brushing is a very important part of achieveing the finished effect. On the easy to reach areas the metalic paint can be a little thicher, but leave the hard to reach areas dark, as if dirt has got in there over the years and is hard to clean out. This weathered look will instantly improve the final appearance of your helmet. I suggest you look around the web for tutorials on weathered metal paint effects (lots of them can be found on plastic modelling and world of warcraft websites). There are so many brillaint examples and I am sure you can do a much better job than I did. Have fun making your own paper mache helmets.